Gloria specializes, but is not limited to, Portrait work. If you want a very special gift for a loved one, corporate exec. or yourself, you've come to the right place. Gloria LeClere, from the Branson Missouri area, is a wonderful artist that specializes in portraits in a variety of mediums. Originally an oil painter, in 2004 she discovered a new passion, pencil & acrylic portraits. Her work is truly impressive. Our apologies to the artist...it's really hard to get a good scan or digital photo of a pencil or acrylic sketch. It never seems to really capture the softness of the lighter lines that really bring out the details. The pictures we've posted really don't do them justice, they are truly works of art to be treasured. Click on a pictures to enlarge. 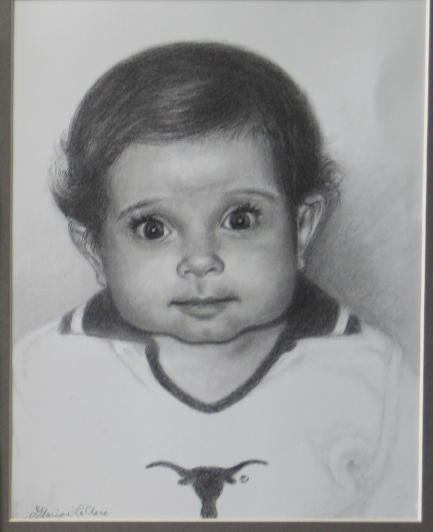 These are not the type of portraits that are done quickly so it's best to let us know what your time frame needs are.